Another week of action in Paradise! Our campsite is taking shape. It’s true camping at the moment, literally. 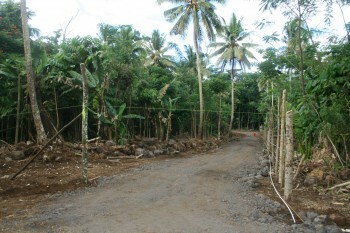 Samoa is pretty much outdoor living anyway, with permanent camping the general feel of the place as we’ve got open walled Fales and a pretty constant 30 degrees year-round make for a camping-type experience once you are out of the resorts and city. Outside living though is a little different for us – we are literally CAMPING in the bush at the moment. Fortuantely the trees drop the temperature a good 2-3 degrees and keep off 90% of the sun 80% of the day, so it is really quite comfortable micro-climate. A gentle breeze coming up the hill and the trees killing any dew, it makes for a lovely spot, actually. 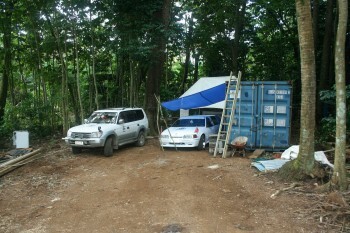 Note the cover for the limo – stops the falling coconuts from damaging it – until the lean-to is built. True! 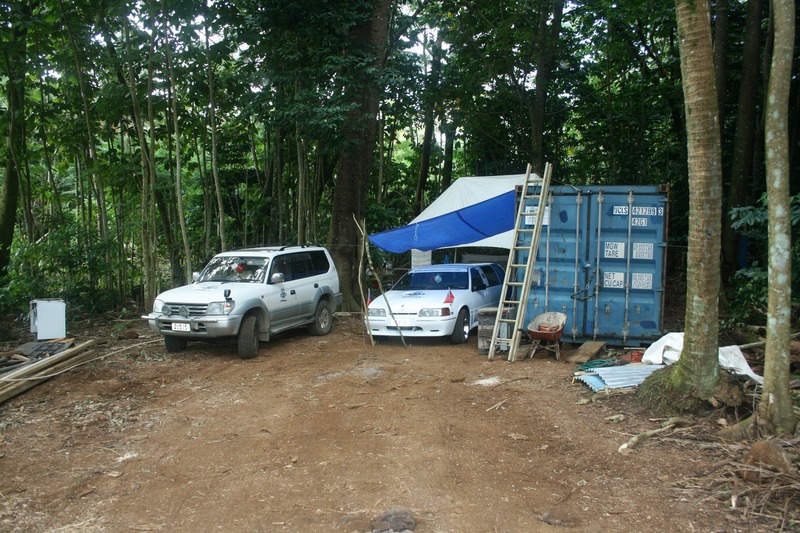 The driveway has been completed – 8 truckloads of fill – teams of Samoan boys all keen for a few bucks for smokes and booze – a lot of sweat and diesel burning diggers and we now have vehicular access to our Campsite. Water is now piped in from the roadside (we tapped into an obliging neighbour’s waterpipe, thanks!) – untreated but drinkable for the brave. That’s me! A one inch sub-main is promised but “We don’t have any 1″ pipes left so it will happen in the next financial year” we are told by Samoa Water Authority (SWA). I think it “might” just happen in a few months. 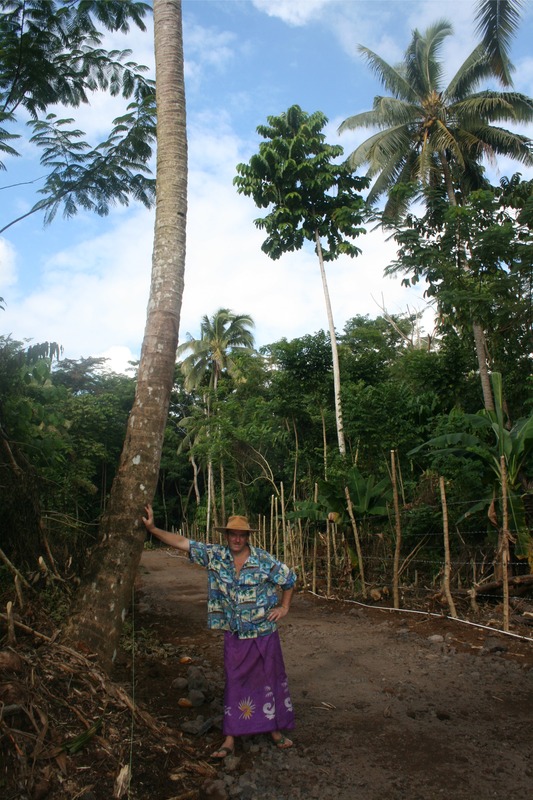 This is one big momma coconut tree that was spared from the axe. Debbie loves her coconut trees and especially this one with a bend, so it stayed, and we can just sneak the road past it, just. Palagi in Samoan clothes – shirt only on for the photo. Jandals optional but necessary on the road. Lavala is cheap and easy to buy, wear, wash. Great once you are used to them. Aussie squashable hat is a must for Palagi nose and ears when in the sun. Now to organise transfer of all our gears from Satapuala . . . and setup an office in town somewhere. We’re getting there after the major hiccup with the Satapuala landlords. Costly and sad to have to move on from The Airport Lounge, but we had no choice really. In the end we’ve ended up with better digs by far but we’ve basically been set back by a year and lost a few quid. We have no power nor Internet at the campsite and are working outside on setting up shop, so I’ll chat to you again a little while later, sometime! The world’s most developed banking systems are dominated by debt, insolvency, negative interest, and reckless abandon. I discovered you had left NZ some while ago and could not find any contact point. Happened to be turning out a drawer today and found one of your old cards! You certainly seem to have moved onto more diverse things!! Did some one take over the Kiwi Accounts software or is there anyone in NZ who can take it off one PC and reinstall it on a more modern one? Hope to hear from you and good luck with your new venture. Mate, we’re waiting for you! It’s all go here I tell you!